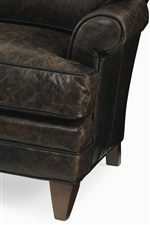 The Klein Rolled Arm Chair-and-a-half & Wide Ottoman with Tapered Wood Feet Set by C.R. Laine at AHFA in the area. Product availability may vary. Contact us for the most current availability on this product.